Resource Description: This brief summarizes the findings of the United States Agency for International Development (USAID)’s Health Finance and Governance project (HFG) in assessing the major sources of inefficiency in the DR’s HIV programs, and how to address them. The brief includes some recommendations for improving quality of and equitable access to HIV service delivery. Their inclusion is based on authors’ assumption that the HIV program will only achieve optimal efficiency in its spending with sufficient penetration of effective preventive and treatment interventions among high-risk groups. 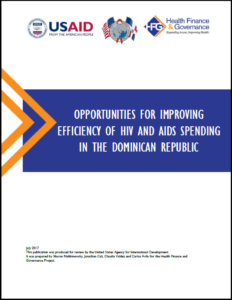 Section 2 of this brief reviews the methodology used, and Section 3 presents sources of inefficiency and proposes potential solutions for improving the efficiency of the DR’s HIV spending to improve the program’s sustainability. Section 4 draws conclusions about the implication of these findings for Dominican health system stakeholders.